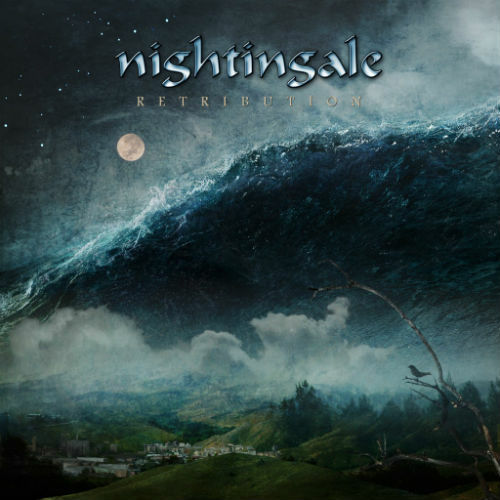 Nightingale Announces New Album "Retribution"
Sweden's Nightingale is back in the spotlight with a long overdue 7th studio album. Entitled "Retribution," the follow-up to 2007's "White Darkness" will be released via the band's new worldwide label InsideOutMusic on January 27th, 2015 in North America. Nightingale was established by musical multi-talent and producer Dan Swanö (Edge Of Sanity / Witherscape) almost 20 years ago and in the good tradition of the band -- which is completed by Dan's brother Dag Swanö (guitars, keyboards), Erik Oskarsson (bass) and Tom Björn (drums) -- the new album once again showcases a timeless hybrid of different musical styles. From atmospheric metal to catchy AOR and melodic prog, "Retribution" offers an amazingly broad variety of moods and always tuneful songwriting skills. Dan Swanö, who contributes vocals, guitars and keyboards, commented: "We started putting material together for this album around 2008, but out of all those songs only two made it to the album. I felt that, unless it is the best possible Nightingale album, where every song on the album easily could replace any song from our previous albums, there was no point in making a new album at all. "During the writing of the Witherscape debut album, I wrote a lot of stuff that would work better on a Nightingale album, and before I knew it, I had the skeleton for a lot of potentially awesome Nightingale songs! It was important that the new material had the vibe of the older albums, yet with a better production and performance. "I am very confident that all the Nightingale fans will love 'Retribution' since I made sure I felt the same rush inside me when I listened to the tracks that I did upon listening to the finished version of our most famous tracks from the past!" 3 Comments on "Nightingale Announces New Album"
I do believe in coincidences. Just today I listened to the whole Edge Of Sanity 1994 and was thinking to listen to Swano's solo projects. But this... !!! Good news !!! WoW cool! This should be interesting.